Okay, I'm going to bite the bullet and make some downsizing decisions here! Twin ewe lambs, out of River Oaks Hattie (Hannah's twin sister) and Kimberwood Harrison (polled black gulmoget). These girls are petite, they should carry polled genetics, heavy Holly and Roban Dillon lines, not registered yet, buyer can choose names, I've been calling them Freya and Freida. 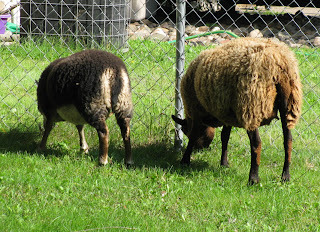 One twin (Freya) is a solid sided black gulmoget (sale pending) and Freida, pictured above as a lamb in May, is black ($200). They may carry modified genes. Single coated, fine, crimpy fleece on both. River Oaks Bo, F3 Minder, moorit yearling ram out of Windswept Boggart and River Oaks Cora. 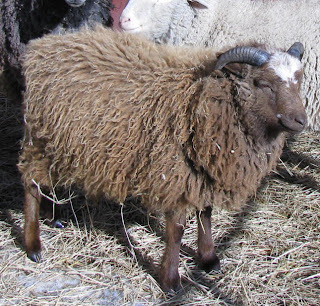 Nice wide horns, great tail and nice fleece. Carries modified and spotting genetics. The photo above is from March, and the one below was taken in May, his horns have grown quite a bit since then. Priced at $200 or BO. Twin yearling Shetland Mule ewes, white $125 each. Two year old Shetland Mule, white, $125. 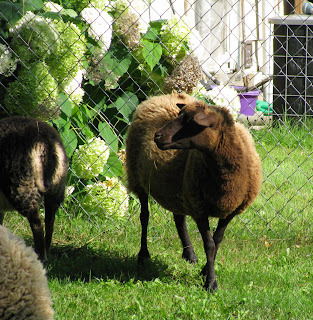 Registered Bluefaced Leicester ram lamb, natural colored, very fine fleece, excellent conformation. 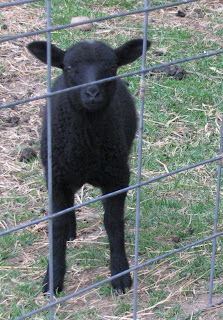 $200 pictured below as a lamb in May. To good home, River Oaks Hattie. Hattie has a bad ankle, not hereditary. She's the black twin sister of Hannah, F2 Holly, three years old. We also have crossbred lambs for sale, some 3/4 BFL's and one 3/4 Shetland ewe lamb. Priced at $75 - 100 each. 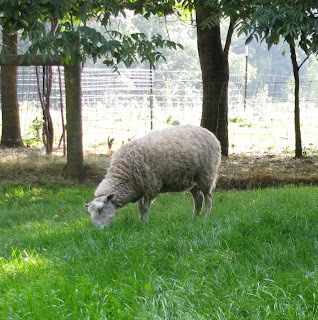 Ewe lambs and intact ram lambs available. This post is a compilation of links you might be interested in, but I had to include these beautiful poppies that my friend Sue grew in composted sheep manure that she and her husband got from us this spring. At three years old, the compost is really nice, like a lightweight potting soil. They put one of those boxed flower seed carpets on it and viola! I'm going to try that myself next year. I'm thinking about doing something with the local school kids. It should be fun. There is a nice pair of Livestock Guardian dogs available near me. I can't buy them myself, but maybe some one out there is in need of a good pair of guard dogs? Third, a friend of mine has this beautiful Schacht Matchless spinning wheel for sale. It's a single treadle wheel with scotch tension, double drive, or bobbin lead options. I had set it up for double drive in these photos. It's in great condition, spins like a dream, very quiet and smooth. It comes with three extra bobbins (for a total of four bobbins) and a lazy kate, $450. Email Deb (woolyewe @ youbetnet dot com) if you're interested. Fourth, Lisa has been dyeing up some beautiful skeins of her BFL yarn recently and it reminded me of these cool socks by Tein Chui. I made some a few years ago and they were lots of fun. A picture's worth a thousand words! In the background you can see the Shetland geese and my little garden. 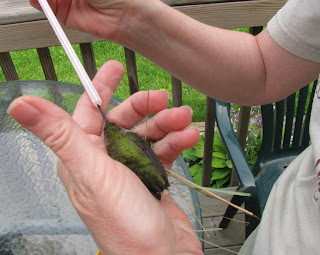 In my hand is the hummingbird I found exhausted on the floor of my barn the other day. It's so cool to hold a hummingbird in your hand! They are so tiny. My son took photos of this one next to a ruler, but they were too blurry to share. This isn't the first time I've rescued a hummingbird. I've found them in our garage in the same condition. The poor things fly into buildings through the open doors and then can't find their way out. It doesn't take long for them to use up all their energy trying to exit through a closed window. When I find them I mix up some corn syrup and water to administer with an eye dropper. No eye dropper on hand these days, so I used an old plastic straw. This one didn't really drink much, but in about an hour, she was able to fly away. Here she is almost ready to take off. I knew she was starting to feel better when her feet starting gripping my hand again and her eyes stayed open longer. But she spent another 10-15 minutes recuperating after this photo was taken. Then I put her onto the plant and turned to grab the camera for one last photo. When I looked back she was gone. I hope she's doing okay. Home Again and all is well! It's good to be home again. The sheep are all doing well, the goslings are starting to honk like grown up geese, and the garden is growing well with all the rain that has come through lately. I'm so glad to have my husband take care of the animals so I can get away sometimes. The one thing he doesn't do is water plants - oh well, my peace lily has come back to life with a good drink. I was happy with the projects I made, but I still have lots of work to get some of them finished. Every night when I got back to the hotel, I would put them on the couch and photograph them. here is a shot from my last night at the hotel.. Day one was a dyed, felted, stitched, and over-dyed shibori scarf... Day two was several felted paper transfer resist dyed samplers... Day three was a wool painting...wet and needle felted. Day four was a needle felted German Shepherd...it was a small class, so we had a whole day of SINCO's undivided attention. 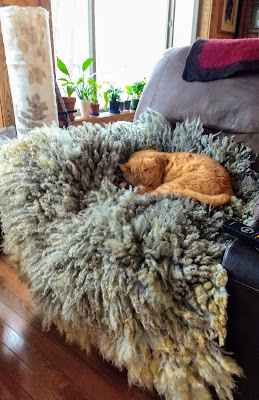 This was the only day we didn't have to do the strenuous process of felting and fulling the wool. But it was still a lot of work getting our dogs looking somewhat like real German Shepherds. I still need to finish the paws on mine. Day five was a felted embroidered bracelet which didn't get embroidered before it was time to go. There will be time for that later. I had a very nice hotel room, complete with a sink, fridge and microwave. I was even able to connect my old laptop to the internet. Thankfully, I met Tricia and Skeeter at the hotel during breakfast the first morning. Since I had gone all alone, I was glad to see them and other felters at the same hotel. Tricia and Skeeter were so nice to let me tag along to dinner with them too. Here we are in the felted jewelry class with instructor, Annemie Koenen, on the right. Annemie was such a patient and fun teacher. Everyone was so friendly and willing to share their knowledge of felting. I wish I could have cloned myself and taken more classes! Susan McFarland did a great job of organizing. The food was really good and the whole event was so much fun. I'll have to save my pennies to go again next year! *This activity was funded by a grant from The McKnight Foundation through the East Central Arts Council/East Central Regional Development Commission.